AIG is a branch of the federal government that has lost tens of billions of dollars due to mysterious, never-explained actions by its officers. So let us see their emails.. let us know how they lost that much money. Slashdot and Calculated Risk have more. So who selected Geithner back in 2003? 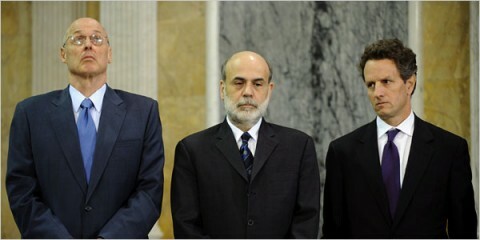 Well, the Fed board created a select committee to pick the CEO. This committee included none other than Hank Greenberg, then the chairman of AIG; J!ohn Whitehead, a former chairman of Goldman Sachs; Walter Shipley, a former chairman of Chase Manhattan Bank, now JPMorgan Chase; and Pete Peterson, a former chairman of Lehman Bros. It was not a group of typical depositors worried about the security of their savings accounts but rather one whose interest was in preserving a capital structure and way of doing business that cried out forâ€”but did not receiveâ€”harsh examination from the N.Y. Fed. Tim Geithner is a tool of the financial industry, a quisling who has more in common with the barbarian tribes that are attacking our Treasury than with the government he notionally serves. This was operationalized through the AIG Bailout. Goldman Sachs, which has taken billions in TARP funds and other government welfare, and had previously stated it had no material interest in AIG, nonetheless received $13 billion in payments from AIG after the government gave even more money to AIG. 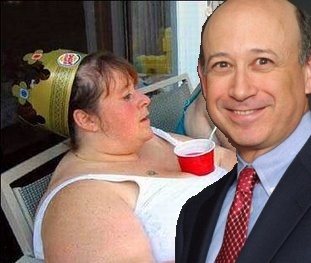 Goldman Sachs is not only a fraudster of a company, it is a welfare queen, dependent on the federal government to pay for its reckless, antisocial behaviors. Other large institutions have benefited as well. In an inexplicably good move (he, after all, liedjust today on ABC’s This Week by saying he spent his entire career in public service) , Secretary of the Treasury Timothy Geithner has asked for the authority to nationalize large financial institutions. I hope he gets it, and uses it. Zombies such as Citi, and welfare queens such as Goldman Sachs, should be seized, their shareholders wiped out, their officers civially prosecuted for mismanagement and criminally prosecuted for fraud, and their assets transferred to the treasury. Just as I support a 90% tax on TARP-funded bonuses, salaries, and capital gains, I support the nationalization of zombie banks and welfare queen financiers. Their raids on the Treasury must stop. Update: Obama has forced the CEO of GM to resign. The head of the UAW, and the CEO of Goldman Sachs, have not similarly angered our President, and still have work. So Tim Geithner’s latest awful idea works like this: put up $1. The Treasury will double it. Then give you $6 dollars. The only catch: you need to bid on securitized debt, such as subrprime mortgage derivatives. Still, the idea of an eBay for subprimes operating at a perpetual 85% discount is pretty attractive. If Tim Geithner is serious about upping the market price of these subprime assets, and Obama is serious about “transparency,” and eBay approach should be used. Any investor who registers should be able to get the same terms as any of the zombie companies Geithner has set up, such as Citi and AIG. Alternatively, the goal is not to inflate the price of these subprime assets, but merely to enrich the zombie institutions. This would be a raid on the Treasury, and should be dealt with accordingly. If the goal is simply to help zombie firms like AIG and Citi avoid bankruptcy, they should be turned into de facto utilities. This should include a 90% marginal tax on all income of the firms involved in the purchase of the securities, as well as on the income of employees and officers of the companies. The greatest threat we face is rent-harvesting by large companies. Large companies have begun using their political influence to survive. GM and Chrysler are welfare argencies. AIG and Citi are zombie financial institutions. These companies are now farmers of corruption, harvesters of unjust enrichment. Some degree of political corruption, favoritism, and lobbying has always made things move smoother in Washington. This is to be expected. But in spite of this, it once was possible for large companies with political friends to go bankrupt. Enron is gone, because Enron is bankrupt. Enron is bankrupt because, even in spite of having personal connections to President Bush, at the time we still lived in a market economy. It was once possible for large companies to go bankrupt. That is no longer possible. Welfare agencies like GM and Chrysler, and zombie institutions like AIG and Citi, now exist to convert political influence into operating capital and stock-holder value. At least as far as these politically powerful branches of the federal government go, the market economy is completely broken. They now operate in the world of political favoritism, where their lobbyists and connections help them burn through the Treasury’s cash. Supporters of GM, Chrysler, AIG, and Citi, private companies that can only keep operating because of generous and limitless hand-outs from the federal government, argue that these institutions are too important to fail. Very well. We have lived in a world of companies that are too important to fail all of our lives. In fact, we have a word for such companies: utilities. Unless we want these raids on the Treasury by big business to continue, we have to turn these zombie companies into utilities. Further, we should do so in a way that prevents anyone of the corporate officers and employees whose buy-in was vital for the raid on the treasury (the CEO, the high-ranking officials, high-paid employees who, if they had left, would have crippled the company, etc.) from benefiting. In an ideal world, we would simply pass the ‘Utilization Act of 2009,’ in which AIG, Citi, GM, Chrysler, and the rest would be turned into utilities, the common-stock zeroed-out, all contracts renegotiated, and so on. Of course, we don’t live in an ideal world. The next best thing is to so cripple the ability of these zombie utilites to operate in the free-market that they become wards of the state, utilities who cannot function independent of the government and who lose any ability to earn a profit beyond what is given to them by the government. In other words, those welfare offices (GM and Chrysler) and post office savings institutions (AIG and Citi) should be run along the lines of the Department of Health and Human Services, where the employees and officers are public servants who are remunerated and a public scale. The 90% tax on bonuses paid from TARP-funded companies is a good step. So would a 90% tax on salaries paid from TARP-funded companies. And a 90% tax on capital gains from TARP-funded companies. The 90% tax on AIG bonuses is as good as we can get now to a Utilization Act, and may lead to further crippling of these companies in the future. We have had 90% tax rates before. We have these so-called ‘retroactive taxes’ (meaning taxes that are collected for the tax year they are written in) all the time. There is no constitutional objection to the 90% tax on zombie bonuses. This 90% tax is not an enemy of the free market, but a friend of the free market. The tax on zombie companies — this de facto Utilization Act — helps protect real contracts. All contracts rely on a functioning price system, a functioning market economy, to mean anything. But AIG, Citi, GM, and Chrysler do not live in the world of contracts. They live in the world of political favoritism. If AIG/Citi/GM/Chrysler get away with this rent-harvesting of the Treasury, it will encourage others to do so. Allowing these zombie institutions to get away with it make contracts meaningless, because only the politically weak are held to them, while the politically powerful can expect bailouts to save them from any inconvenient debt. The tax on zombie companies – this de facto Utilization Act – helps protect us against arbitrary taxation. Whatever ‘taxes’ AIG ever paid has been more than made up for in federal bailout money. Taxes, in a TARP-funded world, are a simple accounting fiction. They may drive the politically weak to bankruptcy, of course. But for the politically powerful, like AIG, Citi, GM, and Chrysler, they do not matter. If you have political friends, you make money. If you don’t, you don’t. In the world of zombie companies, taxation is always arbitrary, and what the IRS says you owe has no relationship to whether or not you will receive or send cash to the federal government at the end of the year (if you are politically powerful). There is only the defense of limited government the power of contracts, and the protection of the citizens against arbitrary taxation. In order to protect our economy, our contracts, and our tax system, Congress must impose the 90% tax on AIG bonuses. Many people are talking about AIG. Some are losing focus. One is Chris Dodd, who denied writing the portion of the Obama Stimulus that protected AIG bonuses, before “remembering” that he did write it at the behest of Geithner. At his bizarre town hall last night, President Barack Obama joked that “Washington is in a tizzy” over AIG and the $165 million in bonuses to be paid to its executives. The New York Times yesterday quoted White House chief of staff Rahm Emanuel complaining that the whole affair was a “distraction.” At Tuesday’s press briefing, White House press secretary Robert Gibbs could not even provide a rough timeline of the administration’s handling of the AIG affair. Yes, it’s true that the bonuses represent less than one percent of the total bailout money that has gone to AIG. And yes, there are legitimate points to be made about retention bonuses in general and (though less persuasive) retention bonuses for these AIG employees. But it has been clear for a while that something — an event, a comment, a cable news tirade, a speech — was going to focus the growing public anger over bailouts and government giveaways. Sadly, some people losing focus on AIG are my friends. Some people even think that taking the bonus money back from AIG solves anything! And regarding the scariness of punitive tax – there’s nothing wrong with following the letter of the law. The IRS code says “reasonable” salaries are deductable for tax purposes. These bonuses are obviously not reasonable. So, don’t allow AIG to deduct them, problem solved. Of course, Adrian is wrong. Adrian’s suggestion is as sensible as punishing a women who has been raped by stoning her, or (if your wallet is lifted) withdrawing some more cash from the ATM, and considering everything back to normal. While some AIG stock is still held by non-government investors (about 20%), this is easily wiped out (and should be too). AIG’s largest stockholder – and largest creditor – is the US government. Making AIG pay back the bonuses, or making AIG to pay more tax, or whatever, is as sensible as responding to a theft against the federally owned United States Postal Service (USPS) by making USPS pay taxes to the federal government. The best thing to do is to levie a 100% excise tax on these bonuses. Of course, this will hurt AIG and similar zombie banks. It will make individuals doubt the ability of these firms to actually follow-through with contracts, and deprive AIG, zombie banks like Citi, and others of talent. Hurting AIG and zombie banks is a good thing. The TARP-funded zombies are a complete disaster, a guarantee by the federal government that as long as you have government friends, you can never go bankrupt. TARP-funded Zombies like AIG and Citi should be so eviscerated that any company thinking of a bailout will be s o afraid of arbitrary and capricious federal oversight that it will not ask. Those who listened to what Obama said during the campaign, and believed it, will be surprised as Treasury’s transfiguration into a xenophobic kleptocracy. Those who read this blog, however, will not be. The problem is not that Barack Obaam is a xenophobic kleptocrat. The problem is that Barack Obama has no idea what to do. However, Obama has not been content to let others make important decisiosn for him in a deliberate fashion. He has wanted results, badly. Obama wanted results like hell, and he got them like hell. American International Group, the insurer that has received more than $170 billion in taxpayer bailout money from the U.S. Treasury and Federal Reserve, plans to pay about $165 million in bonuses to executives in the same business unit that brought the company to the brink of collapse last year. It did not take long for the chilling effect of new restrictions on hiring skilled foreign workers on H-1B visas to be felt. Bank of America has withdrawn job offers to foreign MBA students set to graduate from U.S. business schools. If you read down in the stories, you see the AIG story happens because the Obama administration, in spite of simultaneously being the company’s largest shareholder and largest credtor, has no leverage in this circumstance. The Bank of America story happened in response to the two “Buy American” bills that Obama has signed into laws. Of course, Obama did not plan these outcomes. Obama did not plan Treasury actions that give hundreds of millions to people who did the worst job in the history of the world and publicly high-skilled kick foreigners out of the country. What Obama plans has little relation to what he plans. 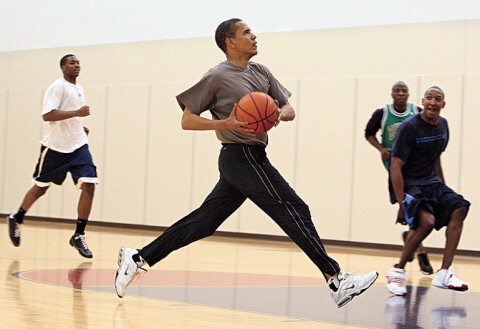 Obama is an incomeptent in a hurry. Obama wants to fix the economy like hell. That explains why Obama is fixing up the economy like hell.